(Volume 2 in a 4-book Cancer Path Series) New Updates below! xxxxxCheck out my NEW Indiegogo.com cancer video. Dr. Sherman’s book, ‘The Cancer Path: A Spiritual Journey Into Healing, Wholeness & Love‘ was the Award-Winning Finalist in the Health/Cancer category in the 2013 USA Best Book Awards, sponsored by USA Book News. ‘The Cancer Path‘ won an Honorable Mention Award for Spirituality Books in the NY Book Festival 2013. Dr. Sherman was honored at a ceremony at the Grolier Club in Manhattan on June 20th, 2013.’ Check out the video on our Press Page. BOOK #3 was inspired by my cancer journey. The day before my 41st birthday I was diagnosed with triple negative breast cancer, stage 2a. This changed everything. I was told that even with aggressive treatment there was a 25% chance the cancer could return, and if it spread, it would be incurable. I was told I would lose all my hair, that I could not get pregnant for 5 years and that I might not be able to work, because I would be very tired. I was quite the planner and suddenly it seemed like cancer was in charge, instead of me. I underwent a lumpectomy, 8 chemotherapy treatments and 6 weeks of daily radiation. I had two weeks to decide how to proceed with my treatment and had very little understanding of breast cancer. I felt like I was a plopped down in the middle of the Amazon Jungle with no map and I had to feel my way out. Of course being faced with a life and death issue made me look deeper and question things. I had lived a good life and felt complete but I received a message from my Higher Self that I still needed to leave a legacy of 22 books behind. Since I had only published one book so far, this made me think that I might be sticking around for awhile. I also tended to be the kind of person who felt that we were meant to learn from our earth experiences. I knew there was a spiritual context for my illness and I wanted to grow from it. I wanted to consult metaphysical and alternative healers as well as doctors, to examine myself on the level of mind, body, emotion and Spirit to see if there were any imbalances or blockages that I could heal during this process. I figured that taking the time to reflect and learn might inspire me and others who were on this same path. Most people look at cancer as a scary, very negative thing to avoid. I was positing that it could be a spiritual journey that leads to health, wholeness and love. So far this has been true to me and I would be so happy if I can help even one person to feel this way as well. So, tune in to see what transpires. This is a work in progress but I hope to have this book out within 6 months time! You can find more videos in my The Cancer Path Blog or on my YouTube The Cancer Path channel. 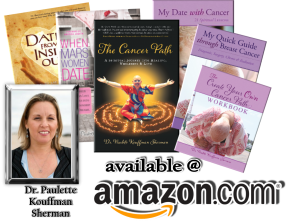 The Cancer Path is a memoir/self-help book about a woman who views cancer as spiritual path. Dr. Sherman describes it as her ‘Eat, Pray, Love’ of cancer experience. 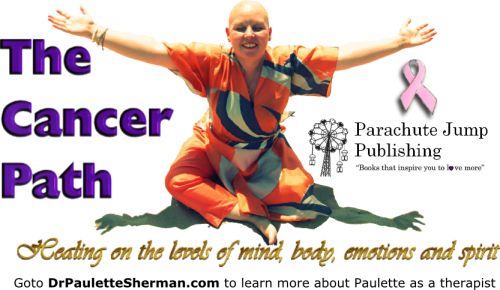 As a psychologist , mother, wife and breast cancer survivor, Dr. Sherman viewed cancer as the zen stick that promoted self-care, healing and greater wholeness. It was a springboard to examine her body, mind, emotions and Spirit. This context made this challenging year of treatment an eternal gift. 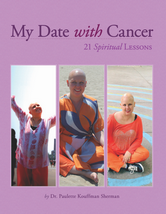 She wrote this book so that other cancer survivors could learn spiritual lessons from their cancer experience too. The Cancer Path examines healing on the levels of mind, body, emotions and spirit, examining controversial questions related to cancer treatment, addressing coping strategies, healing resources and providing many practical tips along the way. Dr. Sherman references over sixty books as milestones along your path.